PlayStation Vita has huge expectations attached to its December launch in Japan and the rest of the world February 22, 2012. With 3DS sales on the rise, Sony wants to get off to a great start with its new portable, and Wipeout 2048 will help the publisher do just that. The Wipeout series is known for two things: thrilling futuristic combat, and gorgeous visuals and audio that showcase a system's technical prowess. Turns out, Wipeout 2048 does not disappoint in either category. 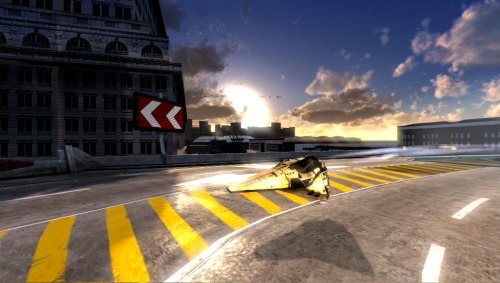 As with Wipeout games past, you control a hovercraft and race against several competitors. The developers litter pads across each track that, when you race over them, offer you different weapons that prove useful in putting the competition in its place, preferably dead last. I was able to hop into a race and pick up right where I left off with the PlayStation 3 DLC game, Wipeout HD. Controls are as tight as ever, with an additional gyro feature that worked wonderfully. Tilting the system left and right felt and reacted naturally, better than many games on competing platforms. In this mode, you also use Vita's rear touch pad to accelerate, and that worked better than you might think. Meanwhile, the graphics really pull you into the experience. This is no iPhone game. Rather, it's a full-featured racer featuring gorgeous tracks presented in a beautiful resolution thanks to Vita's five-inch display. Colors were vibrant and the animation remained fluid throughout, with plenty of cool effects for good measure. During my time with the game, I explored a track called Sol, familiar to many Wipeout fans, and it serves as a great way to showcase the beautiful world. 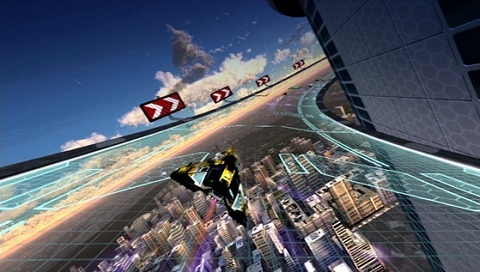 Unlike other Wipeout titles that take place in the distant future, Wipeout 2048 was set in, you guessed it, 2048. Not an extremely long time from now, and the track designs reflect this concept. I began on the city streets of what looked like Manhattan, complete with storefronts and broken down sidewalks, and before long, jetted past the light-filled track at 200mph, reaching a vertical climb that took me out of the urban atmosphere and, literally, into the clouds, darting between the tops of skyscrapers. The track at its highest altitude had no guides and was drawn with a translucent effect, so I could peek down at the streets below as the rest of the racing field tried to blow me to bits. Fun stuff. My time with Wipeout 2048 was brief, and I can't wait to delve into the multitude of tracks when the final version hits stores alongside PlayStation Vita. The promise of cross-platform play between this and the PS3 version will add even more competitive depth to an already fantastic multiplayer offering, and I'm just salivating at the chance to check out just one of the Zone tracks made famous in recent installments. 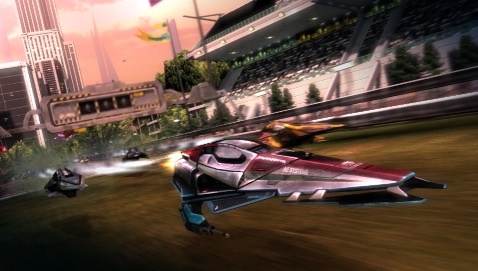 Apple has plenty of gyro racers and Nintendo will always have Mario, but if Sony continues to make games like Wipeout 2048 for PlayStation Vita, it'll push portable gaming to the next level.